Using frozen vegetables in your recipes not only makes them quicker to prepare, but also adds another serving of veggies to your day. 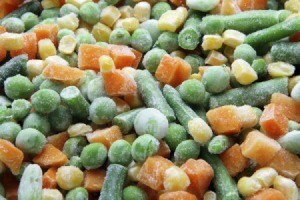 This page contains recipes using frozen vegetables. In saucepan, bring vegetables and milk to a boil. Remove from heat. Stir in a small amount of the hot milk into the beaten egg. Stir this into the hot vegetable and milk mixture. Add 1/2 cup cornflake crumbs, salt and pepper; mix well. Pour into 1 qt. oven-proof casserole. In a small bowl, mix margarine and remaining cornflake crumbs until well blended. Sprinkle over vegetables in casserole. Bake at 350 degrees F for 20 minutes or until firm. Serves 4.